As a special Christmas treat (for ourselves and for you! ), the MDTea faculty had a Christmas quiz at SJ’s house in Eastbourne. 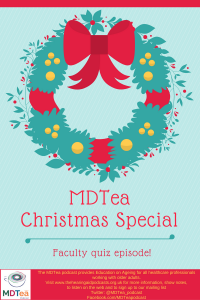 From us, to you, a MDTea Christmas special treat. Hope you all have happy holidays and we’ll see you all back in early 2017 with series 3, which will kick off with an episode on Multimorbidity. To find out more about who our faculty are visit this page.